Latest update: Maruti Suzuki announced a 2 percent price hike across its vehicles starting January 2018 including the recently facelifted Maruti S-Cross SUV. India’s number one passenger carmaker has also toppled Mahindra in the country’s UV segment with its utility products like the Maruti Vitara Brezza, Maruti Ertiga and the Maruti S-Cross. It was back in September 2015 when the sensational S-Cross crossover made its debut in the Indian automobile industry. Being the first premium car sold through Maruti Suzuki’s NEXA dealerships, it was well received by the auto-critics but the hefty price tag couldn’t get Maruti a good number of customers, which it anticipated before launch in 2015. However, the prices of the S-Cross were later reduced by a huge margin and the car was able to foresee its survival in the auto-market. 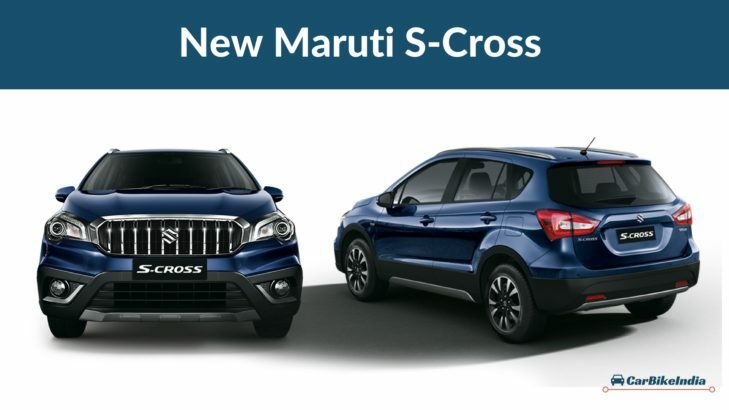 Now again, Maruti Suzuki S-Cross is back in business with its facelifted avatar. And this time, it comes with bells and whistles to stand out from the crowd. The 2017 Maruti S-Cross Facelifted car is launched in India at Rs. 8.49 Lakhs (Ex-showroom New Delhi). Earlier in 2016, at the Paris Motor Show, the revamped Maruti S-Cross was showcased that grabbed the attention of the onlookers. The company has kept the Smart Hybrid technology as a standard offering in all the variants and this is one of the reasons that the new Maruti S-Cross 2017 becomes rupees 43,000 expensive than the predecessor. Let’s dive into the details of the New Maruti S-Cross and know what all has changed. The new 2017 S-Cross crossover is now available in four exciting variants – Sigma, Delta, Zeta and Alpha. The base variant Sigma is offered at the price tag of Rs. 8.49 Lakh (Ex-showroom New Delhi) while the top end variant Alpha comes at Rs. 11.29 Lakh (Ex-showroom New Delhi). It is the Smart Hybrid technology added as a standard offering in all the variants that increases the price by Rs. 43,000. Maruti Suzuki took everyone by surprise by not introducing the facelifted S-Cross with the petrol mill. It is now only the 1.3 Litre DDiS diesel engine which is offered across all the S-Cross variants. The company has dropped the previous 1.6 Litre diesel mill and this time the diesel motor is limited to 1.3 Litre; the basic reason could be that the previous 1.6 Litre diesel mill was an imported one from Fiat which was increasing the vehicle cost by more than 1 lakh rupees. The 1.3 Litre DDiS diesel engine of New Maruti S-Cross churns maximum power of 89 bhp at 4000 rpm and maximum torque of 200 Nm at 1750 rpm. The engine is mated to a 5-speed manual transmission. This new version of S-Cross doesn’t get Automatic Transmission (AT) or Automatic Manual Transmission (AMT). Compared to the forerunner, the mileage of the facelifted Maruti S-Cross has improved. The previous S-Cross had claimed fuel efficiency of 23.65 kmpl which now has increased by 7 percent thereby taking the claimed mileage figures to 25.1 kmpl. The facelifted S-Cross this time got heavy by 35 kilograms and despite the weight being increased, achieving 7 percent higher fuel efficiency is a commendable job done by team Maruti Suzuki. Maruti Suzuki has given an entirely fresh look to the 2017 S-Cross. Under the NEXA portfolio, the S-Cross was never considered a good looking guy and was compared to the adorable looks of its sibling Baleno. But this time, the S-Cross has undergone tweaks and especially the face has got some notable alterations. The vertically slated grille along with the enlarged radiator grille is definitely the X factor of the facelifted S-Cross. The rich and premium look of this crossover is also complemented by the new projector headlamps with chrome detailing and refurbished bumper. The side profile of the car looks quite similar to its ancestor and the rear too carries similar looks like its outgoing model. Changes are noticeable more on the front side and the new character lines give the 2017 S-Cross a totally new appearance and identity. Like the exterior, the interior of the facelifted S-Cross also gets alterations.There is a perfect match of comfort and luxury with ample of seating space and luggage space. The class of the cabins is raised by the soft touch dashboard and perfect cushioning of the seats. Both front and the rear rows offer sufficient shoulder space, headroom and legroom. There is an all-new interior colour scheme and the instrument panel along with dashboard are revised. The new Maruti S-Cross 2017 is offered with many exciting features like Smartplay Infotainment System, Cruise Control, Driver Side Anti-pinch Window, Leather Upholstery, Reverse Parking Camera, Automatic Headlights, Rain Sensing Wiper, Halogen Projector Headlamps, LED Projector Headlamps, Tilt & Telescopic Steering Wheel, Dual Front Airbags etc. 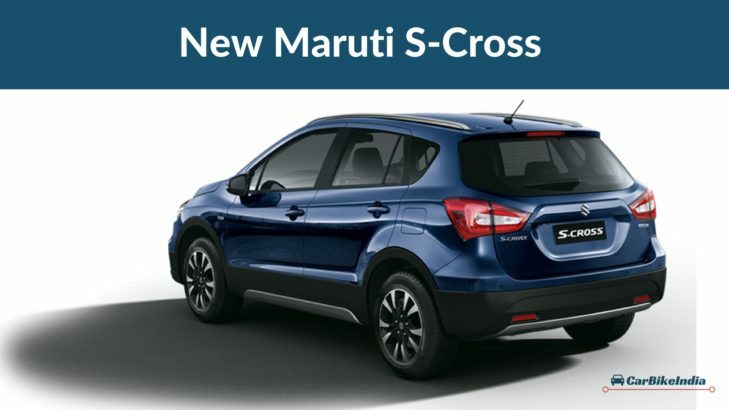 The dimensions of Maruti S-Cross Facelift are slightly changed. The length, width and height measure 4300 mm, 1785 mm and 1595 mm respectively. There is a boot space of 353 litres that can accommodate enough of your holiday stuff. The ground clearance of the car is 180 mm and the fuel tank capacity is 48 litres.